Till now, we have discussed, how to improve website loading speed by enabling Gzip Compression and Cache in Joomla. But if you have to improve your website performance on a search engine, you need some Joomla SEO tools which can help you to get rich snippets on search results and improve your website rank. Rich Snippets are a piece of code that website administrators can add to the existing HTML code of their webpage so that search engines can fetch more relevant content from the website. The terminology "Rich Snippet” refers to structured data markup. This piece of code allows search engines to understand the contents of the page better and provide more relevant search results. In general, when you search online on Google, Bing or Yahoo, you get links to websites with the most relevant content. However, if you use Rich Snippets on your site, the search engines can display a lot more information for a website. It can be details regarding a person, or product reviews and ratings, business locations and more. Often you may have noticed how the search for apps on search engines turn up with ratings, comments, and more relevant information about the app that the search engine can fetch from the app store and display right in the result. Microdata is the most popular of the three. People: Google and Bing now show richer information from LinkedIn or IMDb for well-known people. Also, sometimes public social media profiles are included too. Similar results are possible where the websites show team members, staff and other related people. Products: The most important application of structured data markup is products and related offers. Properties of the products such as the name of the manufacturer, model name, SKU, description, and even prices are available in the search results with rich snippets. Reviews: Product reviews, and even movie reviews, music album reviews can be shown in search results using rich snippets. Businesses and Organizations: Locations of businesses on the map, physical address, contact number, logo and more details can be shown. Recipes: rich snippets allow recipes to be displayed right in the search result, with the entire instructions, requirements, cooking time, reviews and more present right in the search result. Events: Start date, end date geolocation, ticket details of future events can be formatted using rich snippets. However, these are only for future events and not past events. Music and Video content: Google makes provision for rich snippets that include a link to buying albums or individual tracks. Rich snippets can also be used for embedded video content. 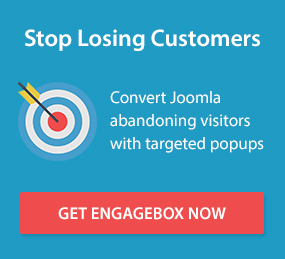 How Rich Snippet Joomla Plugins Help to Boost Ranking? If you are not a techi person and want to set up the rich Structured Markup data aka Rich snippets, it can be hard for you. Because you have to implement the schema tags in your code. So if you are not much aware of coding, Joomla rich snippet plugins are available for you. These plugins help you to integrate the relevant schema as per your requirements in a Joomla article. You have to select the appropriate schema type and you are done. It also helps to reduce bounce rates. Here are some of the best Joomla Rich Snippet plugins for websites using Joomla CMS. It is one of the best rich snippet plugin available in the Joomla extension directory. It improves how your website looks in Google search results. This plugin supports attributes such as site name, site logo, breadcrumbs, a search box for website links, social profile links, and local business listing. It also has extensive support for content types including courses, articles, recipes and more. This plugin is a complete solution for rich snippets, no matter what website you have. It comes with over a large number of snippets for sitewide optimizations and supports virtually any content type. This plugin provides a complete solution when it comes to Rich Snippets. Support for some content, such as Music is on the way and will be incorporated in future versions. Support almost all Joomla third party extensions like K2, EasyBlog, SP Page Builder, Hikashop, Virtuemart, Menu Manager, RS Blog, and others. Support only Joomla articles in the free version. RSSeo is not a dedicated rich snippet plugin but is a complete SEO suite that allows you to optimize your website for better visibility in search results. RSSeo also comes with a Rich Snippet module that allows you to markup content. You get support for Joomla Articles, Contacts, Business details and more. RSSeo is a complete SEO solution for Joomla powered sites that have a lot of other functionality besides just Rich Snippets. If you do not have an SEO suite, you can get RSSeo. RSSeo is a bit expensive and costs around 29€. If you are looking for a vanilla Rich Snippets plugin, then there are other better options. This free plugin allows webmasters to display rating or votes in search results. Moreover, it can display schema.org structured data on the front page, sections and categories. It’s a neat way to showcase reviews and ratings in the search results. Plus, it’s a free plugin. Extremely limited in functionality. Another similar plugin to display the reviews, rating and price range is Microformats vote. The plugin is easy to configure. Microformats vote is a paid plugin. Provides extensive functionality and customization options. Does not make use of the Joomla Update System. This free rich snippet plugin allows you to provide your customers detailed product information in search results. If you are using a VirtueMart product details page, then you can use this plugin to markup product price, currency, stock information, rating, review counts, and the Joomla menu pathway. Free of cost and provides a lot of options when it comes to product content markup. Benefits only sites using VirtueMart. A paid alternative to Rich Snippets for VirtueMart, WK Google Rich Snippets For Virtuemart provides structured markup for articles too. Therefore, if you are running an online store along with a blog, this can be a good option. Automatically updates, easy to use and supports content besides product details. It can be quite expensive for some and is priced at $30. Don't get confused with the name. This paid rich snippets plugin automatically calculates aggregate ratings based on review counts and ratings. Moreover, it can also display individual reviews, video testimonials, and Facebook integration. One of the very few options that provide automatically calculated aggregated ratings. The price tag of $35 can be a little on the expensive side for many. Veertualia allows you to add local business structured data as well as schema.org places data to your articles by merely using a shortcode. You can add places such as local businesses, restaurants, hotels, theatres and more. This is an excellent option for local businesses as well as travel bloggers. Rich snippets are optional, but they help a lot when it comes to website ranking, website discoverability and increased user engagement. It allows search engines to understand the content of your website better. It is a win-win situation for both the website owners as well as for the those searching for information online. However, while creating a rich snippet, it is essential to think like a customer and understand what they can be searching for.